Obama keeping up with Bush's reading pace? 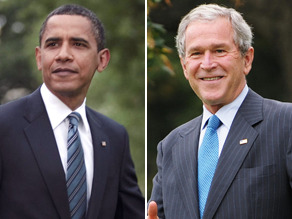 Can Obama keep up with Bush's reading pace? (CNN) - It appears President Obama has to step up his reading pace if he wants to beat his predecessor in one particular measure: how many books a president can polish off a year. In an interview with the BBC Tuesday, Obama said he is currently reading Joseph O'Neill's 270-page novel "Netherland," a book Obama first said he began back in April. If Obama is close to finishing the novel, that puts him on less than a 10 book-a-year pace, far less than the close to 100 books President Bush was reportedly able to finish in the same amount of time. According to former top Bush aide Karl Rove, he and the former president engaged in a friendly wager every year to see who could read more books. In 2006, Bush read 95 books to Roves 110: a Herculean pace of nearly two books a week - in an election year to boot - for the ex-president. But, according to Rove, Bush's reading slowed a bit in the final years of his presidency, finishing a not-too-shabby 51 books in 2007 and at least 40 in 2008. And if that's not impressive enough, Rove also said Bush found time to read the Bible "from cover to cover" every year. While Obama may have had to put aside “Netherland” last month in favor of pages of court briefs with a Supreme Court vacancy to fill, it nevertheless appears the president has some summer reading to do.